When browsing around for VoIP providers, two things become apparent: they have many unwanted extras and most of them don’t give you the option to purchase international numbers. 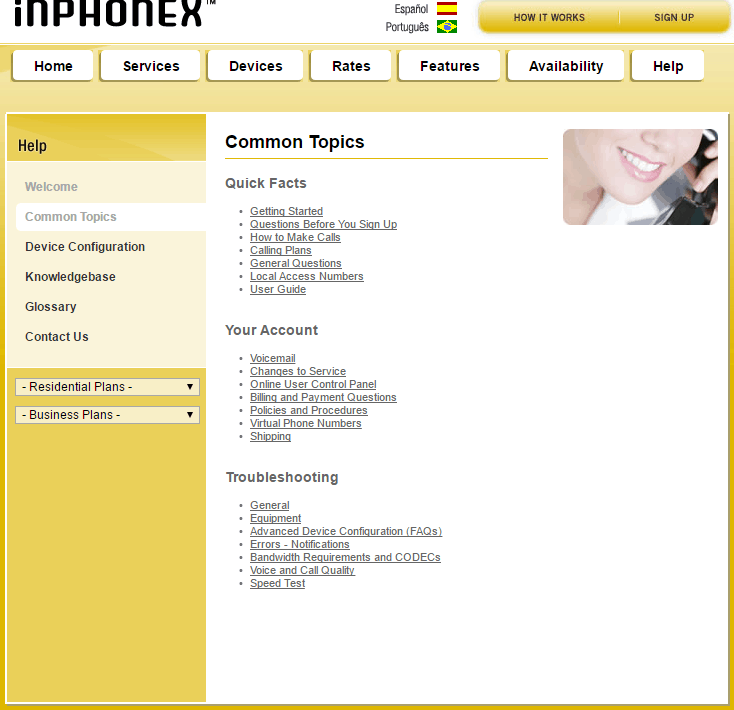 However, if you want to have only the basic features with the option of getting international numbers, consider InPhonex, a Florida-based company that has been on the market since 2003. The company, whose services are available in Spanish and Brazilian Portuguese too, provides the most essential features a decent residential virtual phone system needs; from call forwarding, follow-me find-me, caller ID screening to 3-way conference calling, easy-dial options, and a simple account where all things can be managed. However, the main reason for considering InPhonex is its capability of integrating with various hardware and software, and the countless pricing plans with 30-day money back guarantee and every feature listed on the website. Furthermore, there is the option to even set up many virtual numbers from local ones to toll-free and international numbers, and get answers to your questions via the decent knowledge base. Call handling features are not very impressive with InPhonex, but at least they do their job decently. 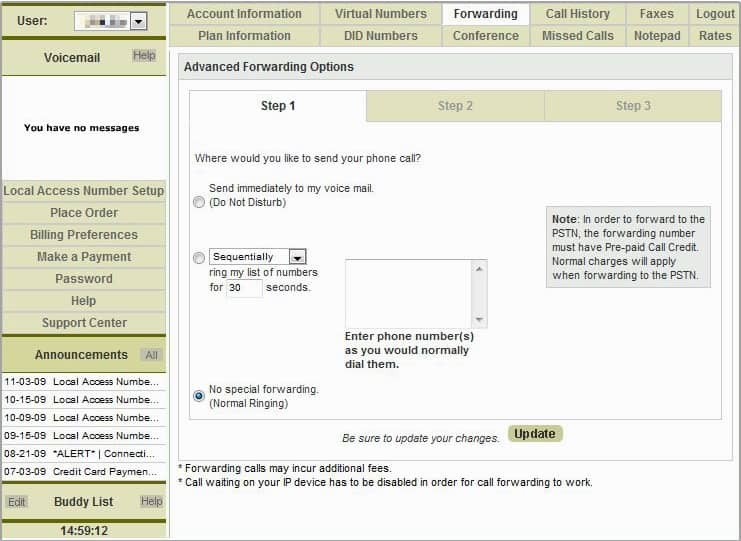 Before forwarding a call, you can decide whether you want all your phone numbers to be rang simultaneously, you can choose call hunting (follow-me find-me) and ring those numbers sequentially until you pick one up, or you can immediately transfer calls to a certain local or international destination. You have the option to block numbers (albeit only international ones), but if that number is within the InPhonex system, you can call it for free without any hassle. InPhonex screens caller IDs, so you can decide whether to decline the call, direct it to voicemail, put it on hold or allow the caller to join the conversation. 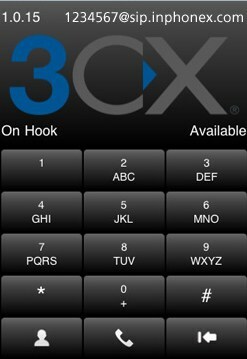 Speaking of that, you have a 3-way calling feature that allows two callers to talk to you at the same time. If you want complete silence for a while, you can turn on the Do Not Disturb mode and callers will be automatically forwarded to your voicemail. However, if you left that mode on by accident and you missed a call (or you missed it for any other reason for that matter), you can return it any time by dialing a simple code. Speaking of codes, 911 is for free (however, fake calls equal in a $25 fine), or you can dial 411 and check residential, business, weather and entertainment listings via a Directory Assistance by simply saying what you are looking for. And as a little extra, you only have to register certain numbers within the system and you never have to authenticate them again, meaning you can initiate calls from the registered numbers without providing a PIN code. The account from which you can manage your phone system does not look promising at all (it has a pure “internet stone-age” feeling), but we can say at least it serves its purpose. It is quite sad though that accessing your account is the only way to learn that you can actually receive faxes (provided that you have chosen a subscription with this feature) and have the option to immediately send faxed documents to a predetermined email address. Thankfully the voicemail option is much clearer. 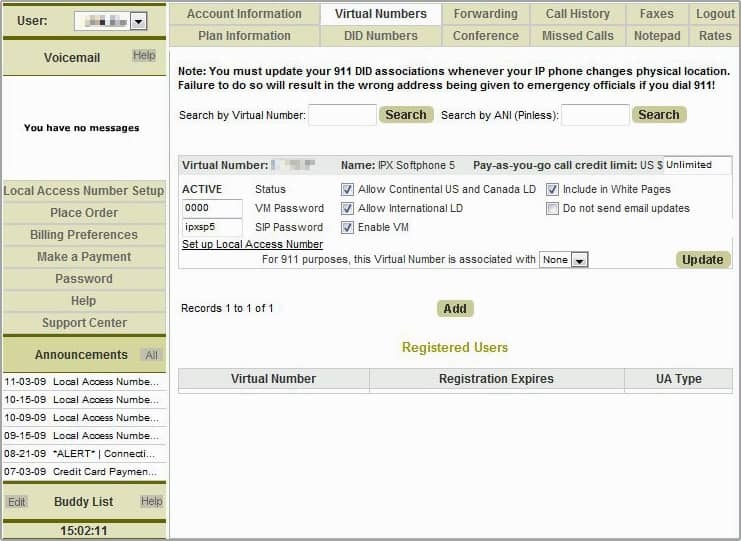 By default you can play, save and delete your voicemails within the account, but you also have the option to save the messages to your computer in an audio format or listen to them over the phone by dialing an access code. 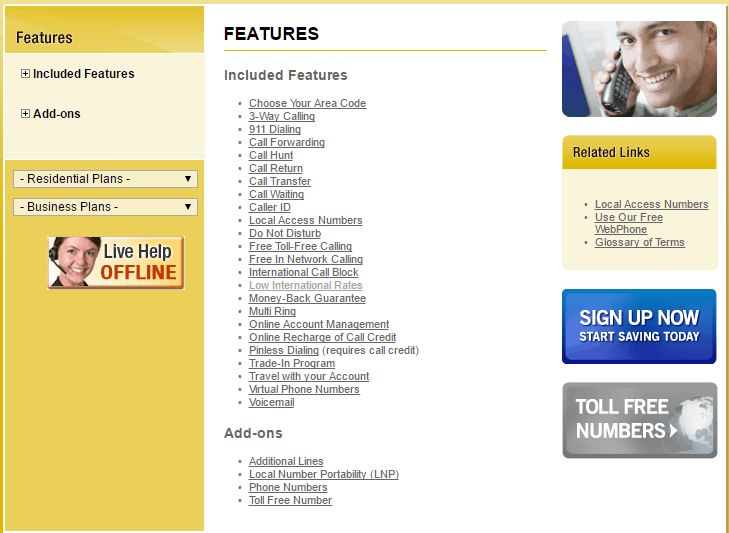 The account is also the place where you can handle integrations, most importantly the softphone(s) you want to use. You can also type, save and email notes in the Notepad section, and check other info like the numbers you possess, the rates applied to calls, your call history and many more. And if you have subscribed to a pay as you go type plan, this is the platform from which you can buy more credits, either manually or by setting up a rule to make the purchase at a predetermined time and date. 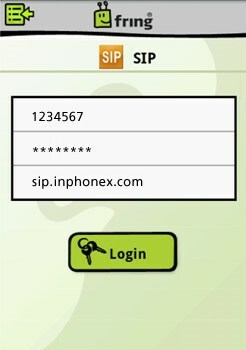 Despite the good selection, choosing a phone number in InPhonex might cause some head scratching due to several reasons. One thing that is 100% sure is that you can port your number from any other phone service provider – but only if you pay a one-time $19.95 activation fee. Confusion starts with choosing a completely new number. 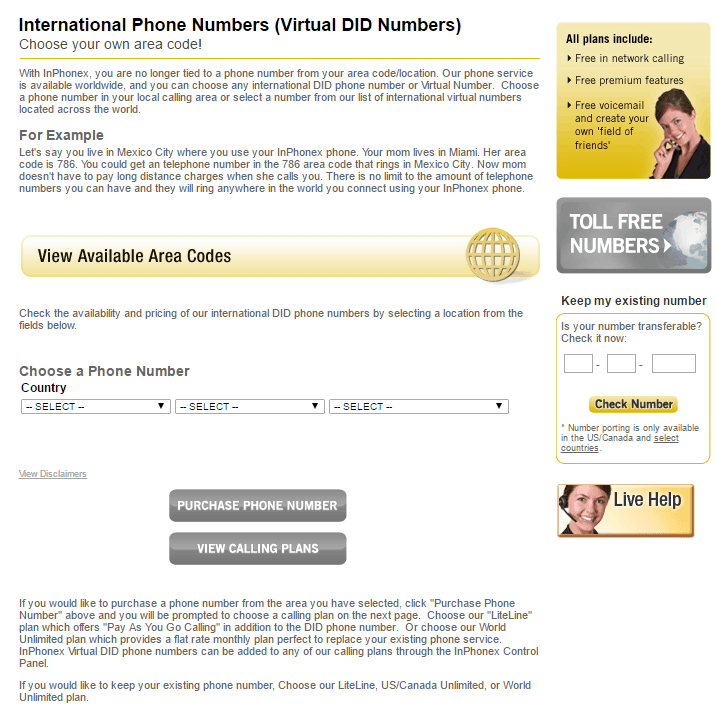 You can purchase toll-free numbers for $4.95 per month plus $0.04 per minute, but you also have the option to buy international virtual numbers starting from $7.95 per month. But the problem is that regardless of your subscription, most pricing plans allow you to choose a local number – whether it’s for a U.S. destination or abroad. Only two subscriptions, namely Pay As You Go and Business Unlimited, require you to choose either a U.S. or a Canadian local number;. However, within these two countries you can purchase any number regardless of your current location. We’re going to be quick with this one: the website doesn’t adapt to mobile screens at all, and there is neither an iPhone nor an Android app for the services of InPhonex. However, thanks to the rather strong integration (which we will talk about soon), InPhonex is at least capable of supporting softphone via third-party apps. And the company has three different solutions for that: the first one is the Acrobits softphone, which supports Wi-Fi and 3G networks. In this softphone you can also receive push notifications for incoming calls, check your emails, record and play your conversations and hear your callers in HD. Another solution is fring, a free app for free calls, texting, video conferencing and group calling accompanied by high quality and an easy-to-use interface. And finally, there is 3CXPhone, the client of which automatically detects when you are out of office, allows you to make simultaneous calls, and setup conference calls. Integration is most likely the only thing InPhonex is extremely good at: if hardware (adapter, desk/IP phone) or software (softphone, PBX etc.) 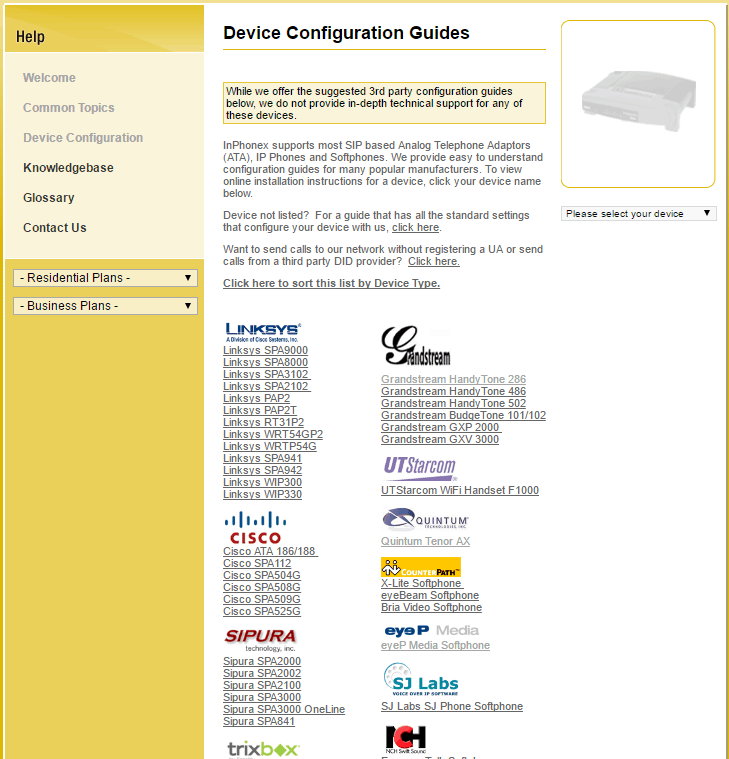 is on the company’s Device Configuration list, then it can integrate with InPhonex. 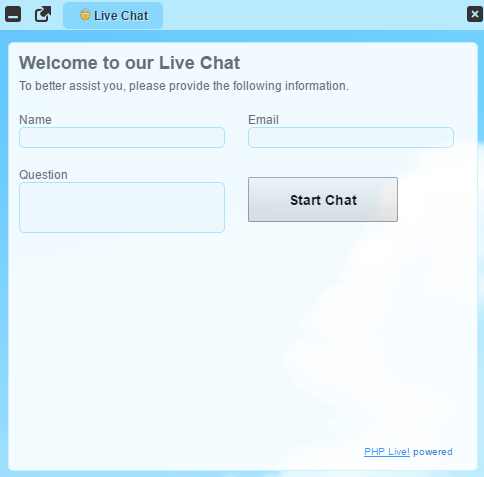 Also known as the software that gives you a taste of Counterpath’s main creation, Bria, you can enjoy crystal clear voice or video calls in a user-friendly client. Speaking of Bria, this interoperable software, which can be a complete replacement or complementary of any desk phone, is designed for businesses and enterprise users who can make voice or video calls, send messages and share their screens with other Bria users. Aside from many regular softphone features, this software is capable of integrating your Microsoft Address Book, can be instructed via voice command and it can even record any call you want. Finding the ideal pricing plan in InPhonex is a torture, because the pages where the plans are explained often exclude the most important information like prices, included minutes, number of lines and so on. However, there are a few clarities: all plans include all features, they are risk-free for 30 days thanks to the money back guarantee and they can be divided into Residential or Business categories. The most straightforward pricing plan is Pay As You Go for $9.95. After paying this initial fee, you only pay the calling rates of the country you are calling. The LiteLine option is basically the Pay As You Go plan with the only difference being a $9.95 credit on your account, which you can have for $5.95 per month (paid annually). Basic 500 is $14.95 per month and includes 500 free minutes, Ultimate US/Canada Unlimited is $19.95 for unlimited domestic and Canadian calls, while World Unlimited lets you call 69 counties in total for $19.95 per month when paid annually. As for the business options you have Business Unlimited for $49.95 per month (only local and long distance calls are allowed) or Business Toll Free Unlimited which is $54.95 per month. The regular customer support of InPhonex is not very outstanding. You can only contact the staff during business hours (not displayed on the website) via a contact module (available from your account only under support center), phone and a live chat that operates as another contact module when the staff is out of office. The other help options are slightly better. In the first page called Common Topics you can read quick facts about the services, information about your account and troubleshooting ideas. 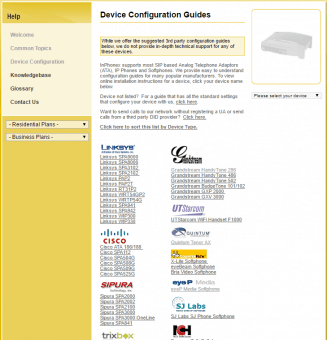 You can also go to the page where you can learn how to configure third-party softphones and the adapters/desk phones you decided to keep when signing up for the services of this company. 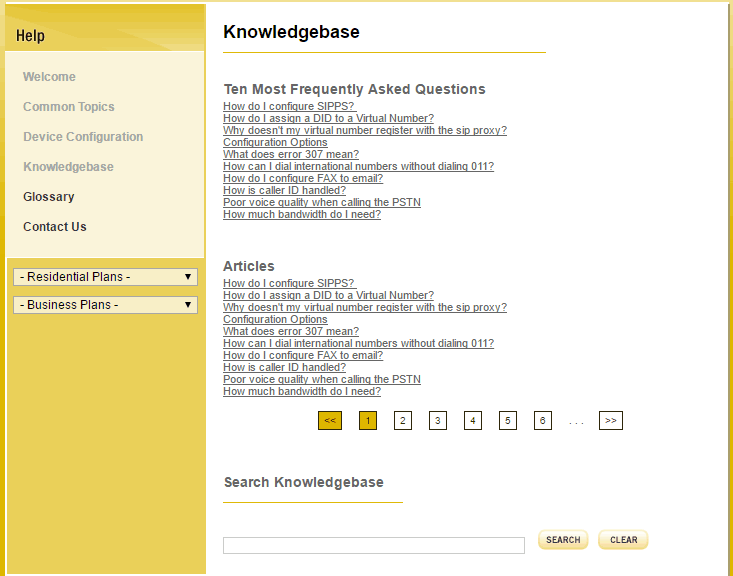 The knowledge base is basically a place for the most frequently asked questions; it is pretty detailed, but like the entire InPhonex website, it is extremely unorganized, making the search for specific answers pretty hard. 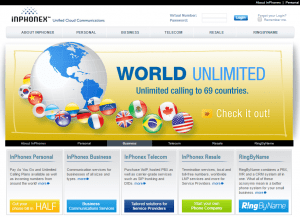 InPhonex is a true relic from an age where VoIP providers were still in their infancy – but this is not a compliment. Although the company is still capable of providing the most essential VoIP features and it even throws in rarities like PIN-less dialing and free of charge Directory Assistance into the mix, it is far from an ideal provider, especially with such below average help options and non-existing mobile support. Their phone number options are good though, especially if you want to get an international number. The pricing plans are all acceptable as not only they allow buying numbers in almost all countries, but because every plan contains all features too. And quite surprisingly InPhonex offers plenty of integration options; whether it’s for hardware or software. Overall, if you accept the lack of features and the stone-age look, InPhonex can be a decent companion. Great price for this service!